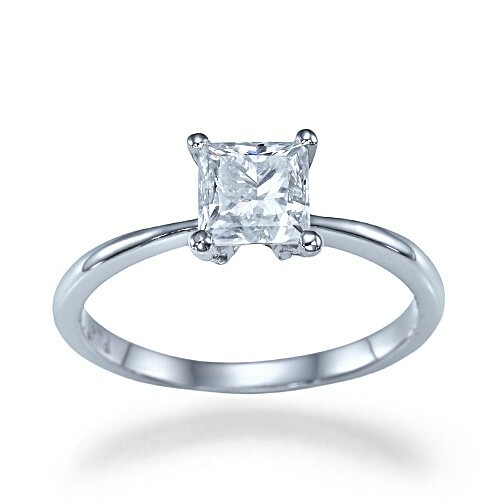 Princess cut engagement rings have a classic square shape that is regal and timeless. This style has been a constant favourite for brides-to-be for many, many years. Versatile enough to work well in a variety of styles, but still traditional enough to appeal to the most conservative of brides, this ring can be as simple or ornate as you choose. 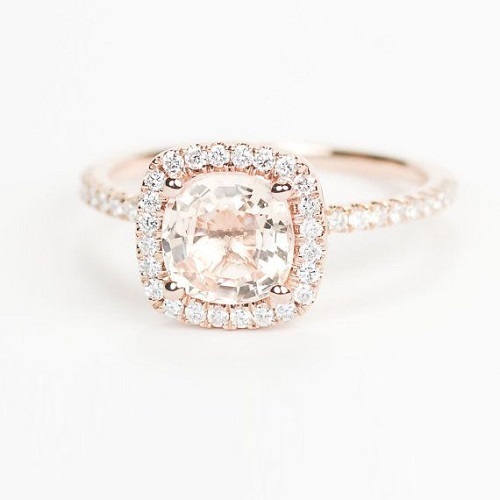 The style is often featured with pave bands, or with a halo style that has tiny stones encrusted around the centre square stone. Contemporary versions introduce the square shape in unusual ways, while different metals or even different coloured diamonds add even more variety to the princess cut. 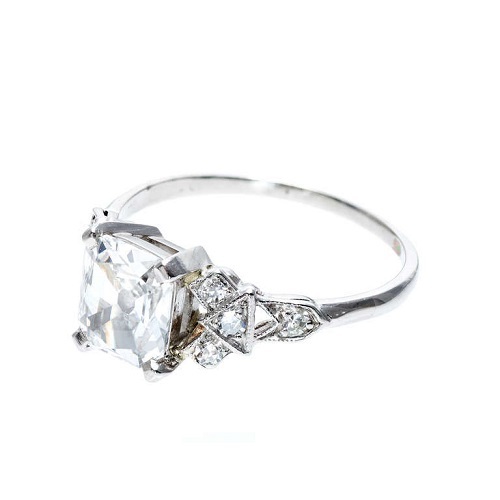 A vintage style with ornate detail works well with the princess cut diamond, adding a touch of whimsy. For brides that prefer a ring that is unusual, this style works especially well. Consider adding floral type detail alongside the stone, or bring in different coloured stones to add more visual interest. With this style you can get away with bolder elements, so use your creativity to make a ring that is truly one of a kind. If you prefer your jewellery to be understated and simple, a classic minimal design will work perfectly with a fine band and a small square stone. Pave encrusted bands add a bit of extra sparkle, but you could choose to leave the band unadorned as well. This delicate style will catch the light without being too bold or over the top. 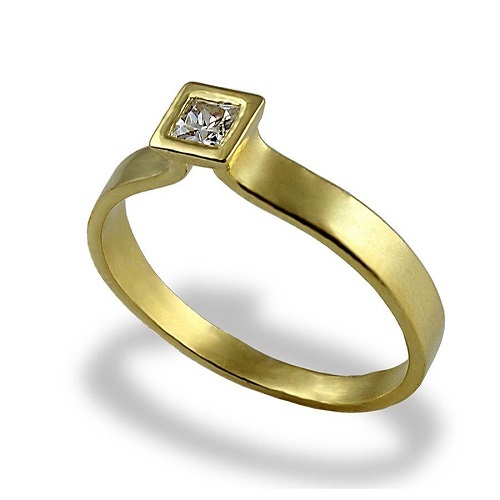 The three stone ring style is romantic, elegant and ideally suited to square cut stones. As the stones have flat edges, they can be lined up perfectly in a row. Add extra sparkle with pave stones on the band, try a split band or keep things focused on the triad of stones with a plain band in platinum or white gold. The copper infused tones of rose gold continue to entrance, adding a dose of warmth into ring bands. This metal goes beautifully with diamonds, offering a chic balance of cool and warm that is subtle and lovely. Pave bands and halo details enhance the sparkle even further. 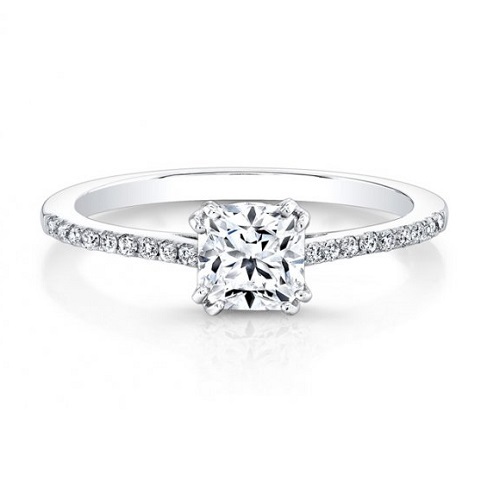 With the princess cut style, the romantic appeal is enhanced, giving you a feminine ring that shines in all the right places. 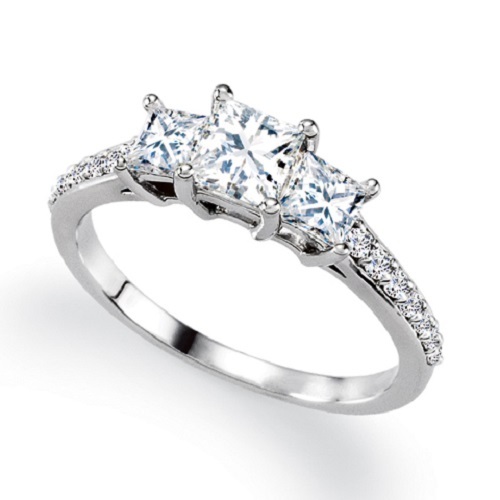 One of the most traditional styles that feature this cut, you cannot go wrong with a princess solitaire. This style keeps the focus on the stone, which is set to sparkle at maximum shine. A cathedral setting that props the single stone up on the band will add stability – ask your jeweller to recommend some options on how to set this type of ring to reduce the risk of snags or loose stones. For something different, and decidedly modern, you could take the concept of the square cut stone and transform it into a contemporary design. Tiny square stones set into the band offer a minimal, paired-down look, while details such as thicker band, elevated centre or unusual metal further enhance the modernity of this ring. While princess cut engagement rings have certainly evolved over the ages, there is no doubt that this ring style will remain a popular choice for brides. He popped the question, you said yes, and now you finally have a chance to publically reveal the most beautiful of all engagement rings that ever were made. This is the moment that many brides-to-be treasure forever, and while the ring is certainly something to get excited about (and flaunt!) it is the love that takes centre stage in any proposal. Before you grab your camera to start snapping away in search of the ultimate engagement ring selfie, consider these handy tips for announcing your engagement to friends, family and social media connections. Take the time to plan your announcement. Doing a quick selfie seconds after your beloved was down on one knee may be hard to resist. You will have plenty of time to make announcements however – the magic of your proposal is not something you can recreate. Take the time to be present in the moment and enjoy your special time together. Once you’ve caught your breath, you can start to think about the best way to share your news with those you love. Stage a photo shoot, with mini props. Use scrabble letters, handwritten love letters, confetti numbers and anything else you can think of to tell a story in a photograph. While the ring (on your finger, of course) should take centre stage, it’s also important that you remember the other details, too. A snapshot of the happy couple, the date of proposal, your answer (just in case that was not glaringly obvious), the location… get creative and tell a story that sums up this major event in one image. Tell those closest to you in person. Don’t let your immediate family and best friend find out on social media – call them to tell them personally. Even if it means a dozen or more calls, this sort of news is best told directly to those you love. And, you will want to hear the happy squeals of excitement on the other end of the line! Once you have told those in your circle (and in his circle), you can make a general announcement in the form of a photo that is shared on social media, a blog or a group email or letter. Announcements can be as short or lengthy as you choose. You could include your story – how you met, how you fell in love, how you got to this point – or you could keep words to a minimum and let your photo say it all. Some couples hire a professional photographer for an official engagement shoot to keep a record of the big moment, while others opt to keep things down to earth with a simple ‘we did it’ type of announcement. If you have a date already in mind for your wedding, you can include this in your announcement. Most couples focus on the ring and proposal, with further updates sent once the date has been confirmed. However you plan to announce your big news, remember to enjoy every single second of the experience, from the moment that your engagement ring is slipped onto your finger!